Professional electrical engineer, specialising in high voltage electricity networks. I'm planning to use some cheap RF remotes and connect a RF receiver to my RPI, which hosts both my gateway and controller. I did try a OneButton-type approach on a MySensors node, but had lots of malfunctions with long-presses (e.g. fade up 10% per second whilst the button is depressed), where the the "button pressed" message gets through, but the "button released" message is delayed or dropped. Is it ok if I link to this as a good build example on openhardware? Of course. I can share the raw JPG images too if you want. NB I used capacitor legs as header pins on the RFM69 because the proper header pins I ordered from eBay are still in the mail. I will not use any smaller / smd components on the top side. All main functions have to be 2.54mm/legs. the booster I designed it for, its pins were mounted the other way around which worked out great. Perhaps an even better solution would be to provide two sets of holes for the booster, so that it can fit in the designated space regardless of which way round its pins are. Great idea! The only consideration is clearance if soldering the Arduino directly to the PCB, but resistors should be ok - the black plastic spacers on the header pins are 2.3mm high, and typical resistors are only 2.2mm in diameter. You could even get away with putting caps under the Arduino, if you allow enough space for the them to be laid on their side if soldering the Arduino directly to the PCB. My 0.1uF electrolytics are 4.1mm diameter, so a directly soldered Arduino would have to sit about 2mm higher than normal. Or you could use tantalum or polymer capacitors, which should be less than 2.3mm high if laid on their side (but more expensive than electrolytics). You could save some space by changing the REG/BAT selection from jumpers to solder bridges, which can be squeezed into a lot more places on the PCB, especially on the back. However, the REG/BAT headers are useful both as a power switch and a great place to connect a multimeter/ammeter to measure the node's current draw, so I'd be a bit sad if you did this. There's enough space under the RFM69 (on the back of the PCB) to mount a CR16xx battery holder. 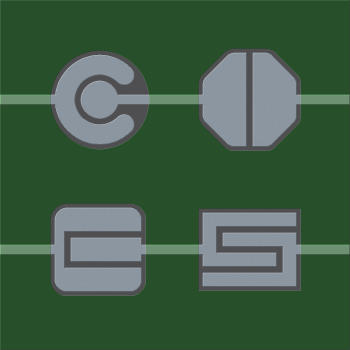 Or if you relocate the adjacent caps, there would be space for a CR20xx battery (which are cheaper, higher capacity, and easier to find). If you were to make the whole right hand side of the board a prototyping area (i.e. clear of components), it would be exactly the right size to mount a 1xAAA battery holder. If you do bring Arduino IO pins out to the prototyping area(s), it would be really useful to put solder bridges in the traces (if space permits), or at least space the traces to make it easy to cut any that aren't wanted. A PCB trace antenna would be really cool! I know that's quite a wishlist, and not all those ideas are compatible with each other, or the Nrf24l01+ version of the PCB, but I hope that provides some useful inspiration nonetheless. @wes Really like those 3.5mm jacks you used for the temp probes. Did you get those from ebay too? The plugs were not great quality - screw threads were mangled so it was very difficult to screw on the backshells. I'd go for slightly more expensive ones next time. The sockets were fine. EDIT: NB the tip and ring contacts on the socket will momentarily short out as the plug is inserted, so it's really important to wire the plugs/sockets so that this doesn't short out VCC/Ground, e.g. Which will cause VCC/Data to short out when the plug is inserted, which is fine. crimping the DS18B20s into the plugs. That's even more genius, love it! Updated to ±0.5℃. I originally looked at this datasheet which says ±0.2℃; I've since found two other datasheets which both say ±0.5℃. I suspect whoever wrote the first datasheet was getting confused between accuracy, repeatability, and resolution. I've just built a few nodes using the EasyPCB Rev 9 RFM69 Edition and I can confirm it lives up to its name - build takes only 15-20 mins, and node works first time because there is no chance of incorrectly wiring the radio. Thanks @sundberg84! According to the MySX specification, MySX header pin 10 should be connected to Arduino pin D4, not D2 (which is already used for the radio)? I put a few layers of insulating tape under the RFM69 so that it sits about 0.5mm clear of the PCB, to make it easier to desolder if the need ever arises (see photo). It would be nice if there were holes in the RFM69 pads so that it could optionally be mounted via 2mm male/female headers. You'd need to make a small adjustment to the antenna length if actually using headers, but otherwise I don't think this would affect the radio's performance. I think the 4k7 pullup resistor for DHTxx/DS18B20 temperature sensors should be on any pin other than D3. The only (easy-to-use) hardware interrupts on the ATMega328P are D2 and D3, and D2 is already used for the radio, so D3 should be reserved for sensors that require an interrupt (e.g. motion sensors, buttons, switches). Hope that's all useful / constructive. Thanks again for designing this awesome PCB! @zboblamont my house actually has Cat5 ports in every room but I never thought of using them to set up a OneWire bus. Genius! Corrections welcome in case I have misread or misinterpreted any of the datasheets or have got the wrong datasheet.